And what a fun time and great meals we had going through the alphabet picking out lettered restaurants. It took us a full year to accomplish our mission, but we did it. 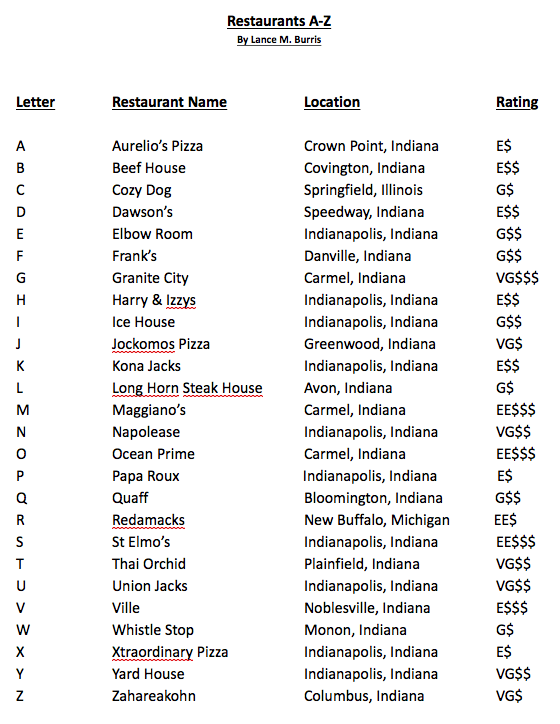 Below are listed the restaurants we visited from A-Z: and rated EE: Super Excellent, E: Excellent, VG: Very Good, G: Good, P: Poor and $: Inexpensive, $$: Moderate, $$$: Expensive. So if you are ever in Indiana or Illinois and want a good place to eat, we would suggest these first-hand visited restaurants for a good meal; some are better than others, but we were always happy with those we visited (for the most part :)). Having completed the alphabet of restaurants, we will now take on another adventure. We will visit every Indiana State Park (24 in number) to hike and explore and probably find some more tasty and unique restaurants.